Craft dies featuring flowers and "Happy Birthday". These high quality, stainless steel, wafer thin, cutting dies are intended for use with most major die cutting machines. Have you tried your hand at the popular dimensional flower making craze? If you haven't yet, be sure to give it a try! 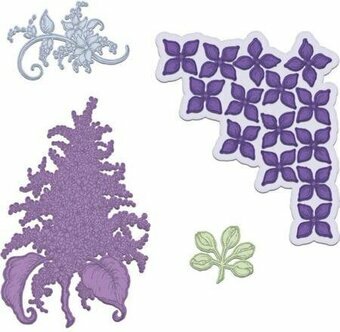 Frantic Stamper brings you three blossom shape die sets that are perfect for cutting flowers from felt, thin flower foam, or paper, which you can mold and shape into beautiful dimensional flowers. This set of 3 dies includes a jagged-petal bloom in the following sizes: 2.125", 1.875", and 1.5" designed to layer beautifully. Our Frantic Stamper Precision Dies work in most consumer table top die cutting machines. Some dies may require the use of a metal shim depending on your machine. Frantic Stamper Precision Die - Grateful Florals Outlines. The Grateful Flowers Outlines dies are designed in a unique way in that they will create backgrounds for the Boho Flowers die set (FRA10275), making this set a truly double-duty die set! This is an exclusive Heartfelt Creations Die manufactured by Spellbinders and will work with most manual die cutting systems. If you have a "loose" machine, these intricate dies may need to be run through your machine a second time, rotating the die 90 degrees with the second pass. Create lacy accents to beautify all your projects with the 5 dies in this collection. Two lacy dies can be used to create flowers or doilies and complement the Arianna Blooms PreCut set. A delicate flourishing vine and two decorative dies are perfect additions for floral arrangements, corner pieces, or 3-D embellishments. Approx. Die Template Sizes: 1. Lace Flower 1: 3.5" diameter, 2. Lace Flower 2: 3.25" diameter, 3. Flourishing Vine: 2" x 1.75", 4. Petal Die: 2" x 1.25", 5. Decorative Swirl: 2.75" x 1". With a wonderful assembling of creative options to "grow" your own garden on handmade cards and scrapbook layouts, the Backyard Blossoms Die is a quintessential staple! These charming backyard blossom die cuts also make the perfect accents to mix and match with your favorite previously released collections! Approximate Image Sizes: 1. Backyard Coneflower: 4.0" x 1.75", 2. Backyard Coneflower Patch: 3.0" x 2.5", 3. Backyard Blossom Accent: 2.75" x 1.5", 4. Backyard Ornamental Grass Accent: 3.0" x 1.5". Fill your glorious garden scenes with a perennial backyard favoritethe Blossoming Coneflower! Attractive and super dimensional coneflower blossom die cut embellishments are quickly and easily achieved! The creeping coneflower cluster, when utilized as a photo framing accent on scrapbook photos makes a stunning visual statement, while a slightly shaped coneflower planting adorned with dimensional blossoms is ideal for taking center stage on summer themed card fronts! Approximate Image Sizes: 1. Blossoming Coneflower: 4.0" x 2.25", 2. Creeping Coneflower: 5.5" x 4.0". 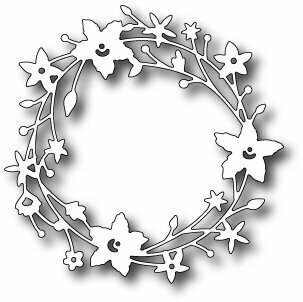 Bring a quaint and peaceful touch to your paper crafting projects with the beautiful flowering dogwood branch or choose from three charming dove die cuts, both wonderful symbols of spring and the Easter season! 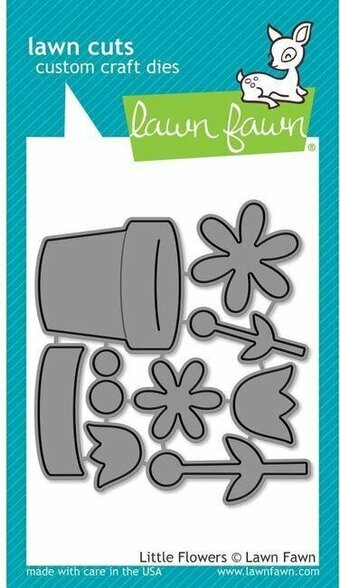 Add a subtle hint of shaping with your flower shaping tools to create exquisite dimensional die cuts ideal for all of your paper crafting creations from Easter greetings, to sympathy cards, weddings and even birthday wishes! Approximate Image Sizes: 1. Seated Dove 1: 2.75" x 2.0", 2. Seated Dove 2: 2.5" x 1.75", 3. Dove in Flight: 3.0" x 2.25", 4. Blossom Filled Branch: 4.25" x 3.5". The elegant embellishment die cuts found within the Flowering Dogwood Branches Die are the perfect finishing touches to complete any spring themed or Easter creations, including handmade greeting cards, scrapbook layouts and even altered art pieces! When paired with the coordinating cling stamps these detailed die cuts are ideal for using as shaped dimensional elements alone or to build upon! Approximate Image Sizes: 1. Flowering Dogwood Frame: 3.75" x 4.25", 2. Blossom Filled Branch: 4.25" x 1.75", 3. Dove: 3.25" x 2.0". Thought to be one of the oldest cultivated flowers in the world, the carnation is extremely recognizable and is known to be a wonderful choice for celebrating birthdays, weddings and just because occasionsand now creating your very own realistic, dimensional carnation with it's gentle ruffles and delicate layers is done with ease using the Large Camelia Carnation Die. 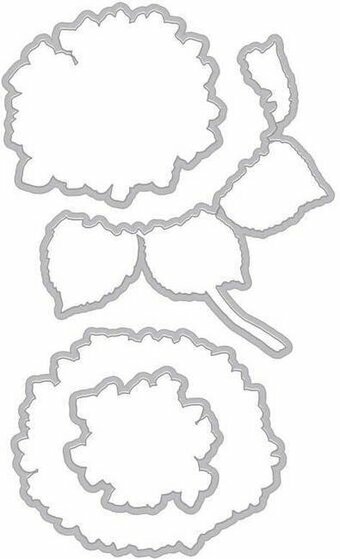 Pair with the coordinating cling stamps to create detailed and substantial sized carnation blossoms perfect for all of your paper crafting creations! Approximate Image Sizes: 1. Large Carnation Petals: 4.75" x 2.75", 2. Large Carnation Foliage: 1.25" x 2.25", 3. Carnation Blossom with Bud: 2.5" x 2.0". Celebrate the season of new beginnings with the romantic, old world charm of the lush lilac blossom! Create your very own realistic, dimensional showy arrangements as beautiful as those first lilac clusters announcing the spring season! When paired with the coordinating cling stamp set, the larger lilac blossom becomes the perfect layering foundation for your small, dimensional lilac florals, creating a wonderful decorative bouquet! Mix and match the delicate lilac petals, cascading sprays and lilac buds for darling dimensional accent variations for use on card fronts, scrapbook layouts and mixed media projects! Approximate Image Sizes: 1. Large Lilac Cluster: 4.5" x 2.75", 2. Small Lilac Spray: 2.25" x 1.5", 3. Lilac Petals: 3.75" x 3.0", 4. Lilac Buds: 1.25" x 1.25". The perfect embellishment pieces to add a touch of old fashioned gentility to all of your garden or heirloom themed projects! The handsome decorative cage, along with the charming, antiquated scroll are the ideal accents to adorn with sweet lilac filled sprays bringing a quaint and tranquil feeling to your all of paper craft creations! When paired with the coordinating cling stamp set, creating delightfully detailed die cut embellishments is done quickly and with ease! Approximate Image Sizes: 1. Sweet Scroll: 2.75" x 3.0", 2. Lilac Spray: 4.0" x 1.75", 3. Cage: 4.0" x 3.75". These dies are part of the Wildwood Cottage Collection and pair with the Wildwood Florals Cling Stamp Set. 1. Vining Floral Cluster: 2.5" x 1.25", 2. Drooping Floral Stem: 2.0" x 2.25", 3. Drooping Greenery Stem: 2.0" x 1.75", 4. Vining Greenery Stem: 1.25" x 2.0", 5. Leaf Cluster: 1.5" x 1.5", 6. Mini Blossom Layers: 1.75" x 2.75", 7. Large Blossom Layers: 2.5" x 2.5". Just the thing for customizing your paper crafting project! The ideal way to cut out a stamped image with ease and accuracy. These dies will work with virtually any die-cutting machine that will accommodate wafer thin dies. Add a cute accent to your project! Made of 100% high quality steel. Joy Crafts Cutting & Embossing Die - making flowers. This larger pinwheel die cuts the shapes for the pinwheel and also cuts tiny holes so that you can easily align the outer holes with the center hole and attach with a brad. Create pretty flowers on your cards with these folded flower dies. Use them in different ways and also in combination with each other. Sizes: 2 3/4" sq. 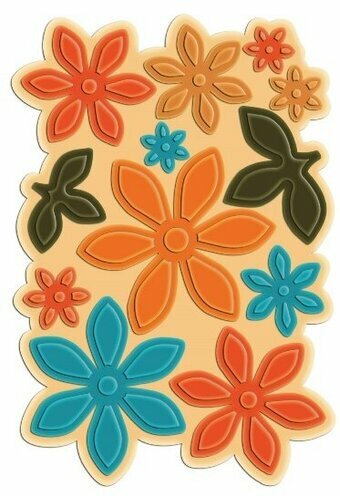 Flower Garden Dies - set of 8 dies. Measurements: DIE 1: 7/8" x 1 11/16", DIE 2: 15/16" x 2", DIE 3: 3/8" x 1 5/16", DIE 4: 15/16" x 2". Artist Laurel Burch strove to create images that would remind people of the ongoing world of the spirit. Magical, beautiful images that will give you the freedom of expression to color and enjoy. These high quality, stainless steel, wafer thin, cutting dies are intended for use with most major die cutting machines. 7 pieces. Marianne Design Perfumed Paper: Lilac. Delicious perfumed lilac paper. Perfect for adding that special touch to your projects. 4 images on 1 sheet, plus 4 sheets of lilac patterned perfumed paper. Size: A5 = 6" x 8.25". Create perfectly punched circles with pretty, die-cut borders using the Martha Stewart Crafts Layered Flower Circle Edge Punch Cartridge, base sold separately. Use with the Circle Edge Punch Starter Kit (sold separately). The innovative tool punches edge designs from 6 inch to 12 inch in diameter - and you don't need to trim your paper first. Make doilies, decorations, placemats, cards and more with ease.